By John F. McKenna (McJack): World Boxing Organization (WBO) welterweight champion Manny Pacquiao (53-3-2, 38 KO’s) remains the heavy favorite to defeat WBO/WBA lightweight champion Juan Manuel Marquez (53-5-1, 39 KO’s) with just two weeks to go before their much anticipated Trilogy. 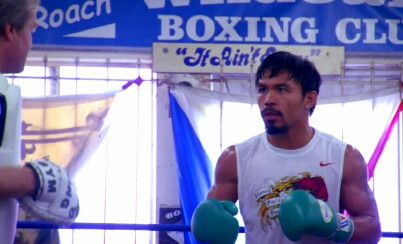 “Pacman” and “El Dinamita” will settle the score once and for all on November 12 at the MGM Grand Arena in Las Vegas. Despite all the hype which points out that Marquez too has added muscle since his last battle with Pacquaio in 2008 the odds are stacked approximately 8-1 in “Pacman’s” favor. Recently a video of Marquez was circulated across the internet showing a bulked up “El Dinamita”. Among the reasons Manny has been the heavy favorite going into the 3rd fight of the Pacquiao – Marquez Trilogy is that since the last time they met Pacquiao has grown into a bigger, stronger fighter. In their first fight in 2004 Pacquiao and Marquez fought at 126 pounds. That fight ended in a controversial draw, even though Manny floored Juan three times in the first round. It was later revealed that one of the judges incorrectly tabulated his scorecard, which deprived Pacquiao of a narrow victory. In their second meeting in 2008 fought at 130 pounds Pacquaio was awarded a razor thin victory. In that fight too Manny floored Marquez, but there were many who felt that Juan won the fight. Almost as soon as the 2008 bout ended, Marquez started clamoring for a rematch claiming he was robbed of victory in both the 2004 and 2008 fights. While it is true that Marquez has bulked up to a higher weight to face Pacquiao, it is thought by many boxing observers that Manny will carry the added weight more efficiently than the smaller framed Marquez. Pacquiao normally fights at about 145 pounds and has fought at that weight for a considerable amount of time. Marquez on the other hand fights as natural lightweight. In addition Pacquiao has retained his explosive speed and power at the higher weight, while Marquez appears to have slowed down. Even if the slowdown of Marquez is minor, it is significant. Boxing after all is about minute fractions of seconds. A fraction of a second is oftentimes the difference between landing a KO punch or being caught by the same. At 38 years old Marquez has almost certainly slowed down to some extent. Pacquiao on the other hand, who will not turn 33 until December 17, is still fighting in his prime. Lastly, but perhaps most importantly, Manny Pacquiao has been transformed into a different fighter since being taken over by five time “trainer of the year” Freddie Roach. Manny now uses both hands with maximum efficiency. He moves in and out using footwork that did not exist in his repertoire in the pre Roach days. His conditioning and strength under conditioning trainer Alex Ariza has improved enormously. True, Marquez may now be utilizing some of the same training techniques employed by Pacquiao, but he will not benefit to the same degree as a fighter who has used those techniques consistently for a number of years.